Patty Sheehan and longtime partner Rebecca Gaston have two teenage kids: daughter Bryn and son Blake. 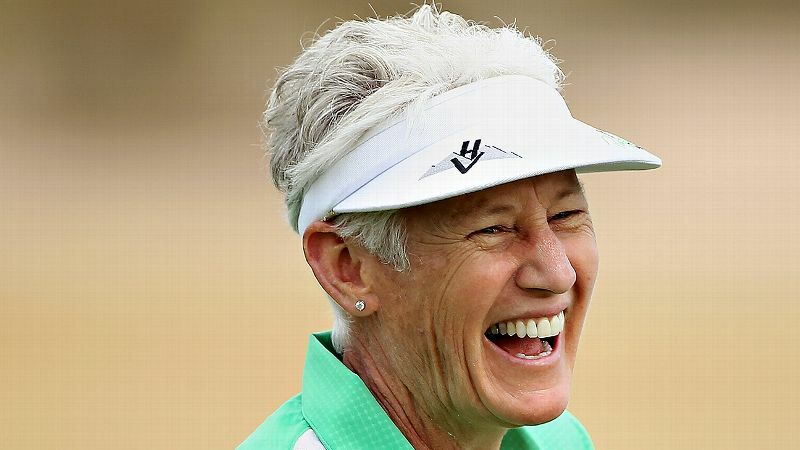 During each of the LPGA's five major championships, espnW will chat with a past champion and see what she's up to. This is the fourth interview in that series. Patty Sheehan spends her days checking things off her ever-growing list. The kids. The dogs. The parents. An upcoming move. Not always in that order, but always on the list. For Sheehan, you see, it's all about family right now. Daughter Bryn is heading out in a month for her freshman year at UC Davis and 16-year-old Blake will soon be a high school junior. Sheehan and longtime partner Rebecca Gaston married on New Year's Eve in 2013, and Patty's mother and both of Rebecca's parents live in town and get their share of time, too. So do the family's six rescue dogs and the vegetable garden. And if that's not enough, the family is moving. "We're downsizing,'' Sheehan said. "The idea is to de-complicate our life, but in the process, it's all so hectic. Just lots of stuff." 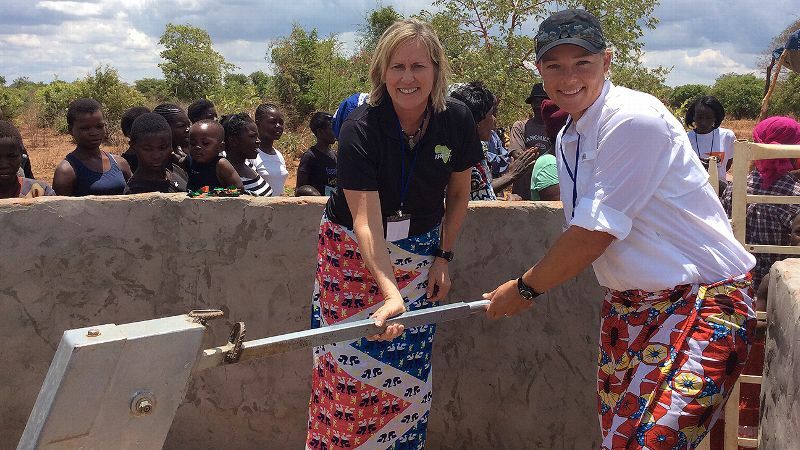 The Hall of Famer stepped back from the LPGA Tour in the late 1990s to spend more time with her family, and she's immersed right now. There's no time to play a little recreational golf or even watch much golf on TV, but she did keep an eye on the recent Open Championship at St. Andrews. espnW: That was quite an Open, wasn't it? And quite a run at history for Jordan Spieth, who fell just short of winning the first three men's majors of the year. Patty Sheehan: I watched what Jordan was doing. I was rooting so hard for him. That [winning the first three majors] would have been so great. He was just right there, too. espnW: What are your impressions of Jordan? PS: I'm just in love with that kid. In my eyes, he can do no wrong. I don't know him personally, but everything you see and you read about him... he can do no wrong. He's a dream for the game of golf. He's the best thing to come along for this game in such a long time. espnW: The men are suddenly following the women's lead -- a lot of young players are dominating. What are your thoughts on the young players? It was so hard to travel with the two kids and we had two dogs, too. After about three years, it was like I can't do this anymore. ... I kind of faded away. I didn't say goodbye. I just left. PS: I don't get to sit down and watch golf much now because I'm so on the go. But when I do, I really enjoy what I'm seeing. I don't know most of those young ladies anymore. I can't relate to the style of golf they play. They're so calm and cool about everything. And for me, I just remember being a bundle of nerves, and I don't see that in these young ladies. I find it fascinating. I don't know how they do that. They are coming out young. I did meet Brooke Henderson and her sister [Brittany] when I was practicing down in Palm Springs in February. I was very impressed by the way she hits balls. She's 17 and didn't have her tour card and I didn't really realize how good she is. I was really impressed watching her hit, but I never got to see her play [in Palm Springs]. Very nice young lady and a nice family. espnW: What current LPGA player reminds you of you? PS: I guess the closest I can think of is Stacy Lewis, probably her feistiness. She just keeps grinding and grinding. espnW: The Ricoh Women's British Open is this week. 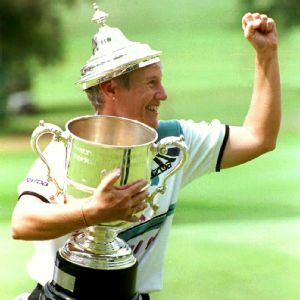 The tournament was a Ladies European Tour major when you won it in 1992, but it wasn't even a co-sponsored event with the LPGA back then, let alone an LPGA major (it became one in 2001). Still, you are the only woman to have won both the U.S. Women's Open and Women's British Open in the same year. PS: I know. It's the only record that I hold, I think. espnW: There have been a lot of great players since you won. Does it surprise you that no one has equaled that? PS: It's not easy to do. 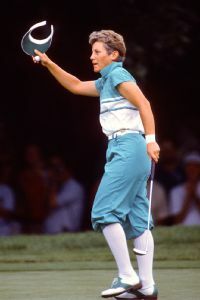 Patty Sheehan beat Juli Inkster in a playoff to win the U.S. Women's Open in 1992.
espnW: You had beaten Juli Inkster in a playoff to win the U.S. Women's Open at Oakmont at the end of July 1992 but weren't qualified for the Women's British. In fact, you were the sixth alternate when you entered the event. PS: I just put my name on the list and kept checking to see where I was. I got the call the week before that I was in. I had to scramble to get warm clothes. I was up in Seattle [playing in the Safeco Classic] and it was beautiful. Rebecca had to fly home to get my rain gear, my heavy-duty clothes and a bunch of other stuff. Then I got over there and the airlines had lost my clubs for a couple days, so I finally got my clubs the day before the tournament started. It was kind of nerve-wracking playing practice rounds with the assistant pro's clubs, which were about D5s, a little too long, a little too upright and yada yada. ... But once my clubs arrived, my clubs never felt so good. It was like, "Ahhh. This is the chocolate cake of my clubs." espnW: It was your first look at British golf, although you played Woburn Golf Club, which was more a parkland course, rather than a links course. And you got a surprise over there, right? PS: There were some people over there who I knew from home and I didn't know. They didn't know I was there until they read it in the paper and they drove over and showed up on the practice range. I hear "Hey, Patty," I turned around and omigosh, it was someone I knew. One of them was a teacher at my junior high. Obviously there are a lot of people who travel today to watch players, but it was kind of unheard-of back then. espnW: As crazy as the start of the week was with the lost clubs, you found a little inspiration in a movie that week, didn't you? PS: The movie "A League of Their Own'' had just come out, so I went and watched that and for some reason that was a really inspirational movie for me that week. It was set back a long time ago -- women weren't accepted playing baseball, and the men treated the ladies not so nice. It just kind of made me mad and got me all fired up. It was a great inspiration for the tournament. espnW: You trailed Corinne Dibnah by a shot going into the final round but closed with a then-record 67. At what point did you know you had it? PS: I think I was on the 17th hole and I made a really long -- about a 35-foot -- putt for birdie that put me four shots up. I hadn't slept well the night before. I kept thinking, "What am I going to do coming down 18?" It was a par-5 and it was OB really close left. So many times in my career when I'd get to the end of a round and I was tired and exhausted and kind of hanging on by a string, I'm thinking if I get to that point, what am I going to hit off the tee? I don't want to hit driver, because I'll probably snap that sucker out of bounds. You have all these thoughts of how I'm going to play it. So I'm thinking, if I get to that point and I'm one shot ahead or two shots or whatever, I'm going to hit 2-iron off the tee and just make sure I get the ball in the fairway. So that's what I did. I hit 2-iron off the tee, then laid up with a 7-iron and hit 9-iron onto the green and two-putted for par. I just felt if I could get into that position to win the tournament, I didn't want to blow it on the last hole, so I was just going to play chicken coming down the last hole and do what I had to do to make a par. 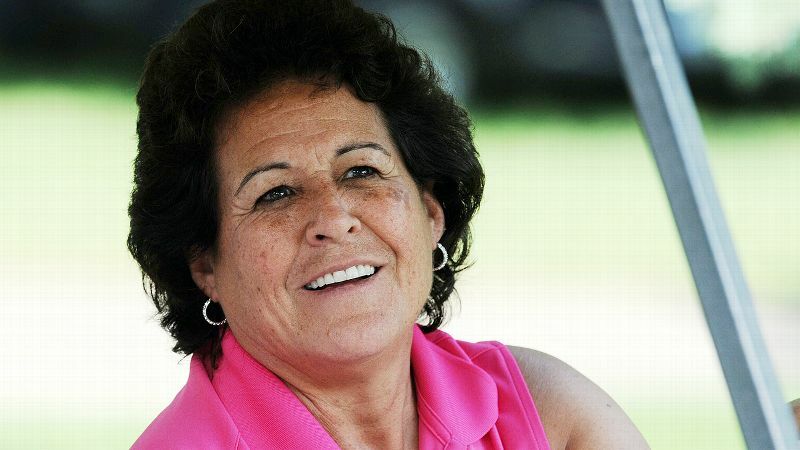 Patty Sheehan is the only woman to win the U.S. Women's Open and Women's British Open in the same year. espnW: What made you want to play the Women's British? Not many LPGA players made the trip back in those days. PS: For some reason, I thought it would be a good idea. I had really not played much overseas at all. Maybe I had talked to Jane Geddes because she had gone over there and won it (in 1989) and said it was so much fun. espnW: You played the Solheim Cup in Scotland [at Dalmahoy, where Europe won 11½-6½] a few weeks after you won, but did you then put the Women's British your schedule? PS: No, I just went back to defend. That was it. 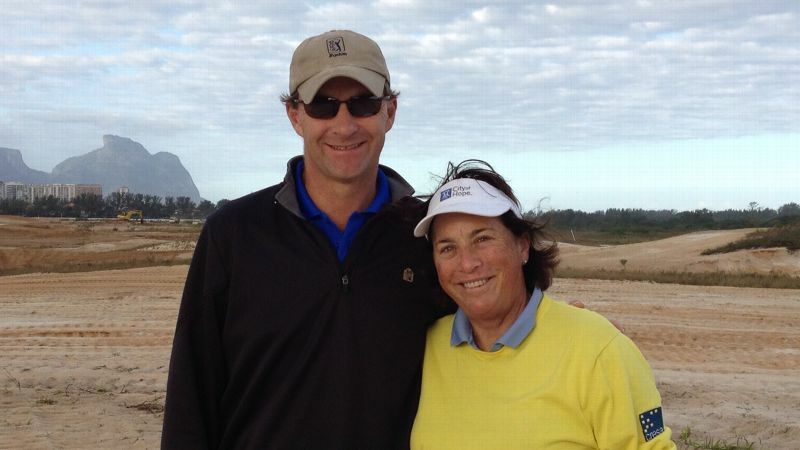 I did go back to play the 1996 Solheim Cup in Wales [U.S. won 17-11], but by then I was getting a little bit older in my career and it wasn't a sanctioned event. I don't know why it wasn't on my schedule. I just didn't give it much thought. espnW: And when it did become a major in 2001? PS: By then I wasn't playing a full schedule. I was leaving the tour. We had two kids and I didn't want to be that far away for that long of a time. I did go over and watch some Americans play when I was Solheim Cup captain [2002 and 2003]. espnW: In 1980 you won the Broderick Award as the outstanding college female athlete and you won the AIAW [Association of Intercollegiate Athletics for Women] golf title. The NCAA didn't have women's Division I championships until 1981 and didn't take over fully until 1982, so you've seen women's sports really evolve over the last 40 years. PS: In 1980, it wasn't that long since Title IX had come about in 1972 and we were still trying to figure it all out. Women's sports has come leaps and bounds, mostly in the acceptance of the general public. You're now seeing people talk about the soccer team that won the World Cup. You're seeing people who don't know anything about soccer talking about it. And I don't know anything about soccer and I was talking about it. And, you see people who aren't really that interested in sports talking about it, and that really wouldn't have happened when I first went out on tour. You see people who love the game of golf and they're starting to understand and not be so closed-minded about the foreign players playing the LPGA Tour. It is no longer a U.S. tour. It is a worldwide tour and people are starting to get used to that and accepting the names that are up there. And the nice thing is, some of those foreign players are trying very hard to speak English and be able to communicate very well and on a very high level. I think they're doing a great job and I think that's helped women's golf come to the forefront with people talking about how good these players are and who they are. It's pretty impressive how they've learned the language and how to express themselves so well. It can't be an easy language to learn. espnW: By the late 1990s, you were really cutting back on your LPGA Tour schedule. PS: It was so hard to travel with the two kids, and we had two dogs, too. After about three years, it was like, "I can't do this anymore. I can't concentrate on golf." It got to be too much. Bec did a great job of taking care of the kids when I was playing and practicing, but I think that maternal instinct in me would not let me concentrate fully on my golf, so therefore, I couldn't do both. I said, "Something's gonna give, and it's not going to be the kids." So I just packed up and came home and basically that was it. For me, it was just too hard for me. I know a lot of guys get up in the morning and come home late. That's great for them but didn't work for me. I had to be home with the kids. That's why I kind of faded away. I didn't say goodbye. I just left. espnW: Concentrating on family agrees with you. PS: It's very time-consuming. I enjoy it. I never really had that chance when I was playing the tour to give that much time to my family, so I enjoy that now that I can do that. And the kids, they take a lot of time, they're teenagers and they don't always want to hang out with their parents, but they still take time. It's not about letting them do their own thing all the time. espnW: You've also become an honorary master gardener? PS: I've had a vegetable garden for several years. I like tinkering. I think a friend told another friend who was in the gardening co-op here and they thought it might be fun to give me honorary status. I love to grow vegetables. I try some different stuff every year. Sometimes it works, sometimes it doesn't, but I love eating fresh vegetables out of the garden. I think it's the coolest thing. espnW: And you do spend time with your Patty Sheehan Foundation. PS: We distribute a little money around town to women's and children's efforts. I'm trying to do my part. [The foundation] is sort of a little more like my personality -- under the radar. espnW: Once the family settles in with the move, will you play a bit more on the Legends Tour? PS: Yes. I'm just really concentrated on my family right now and I don't get to play golf. Too busy. It's all about the kids, Bec's parents, my mom; it's pretty much family time. To add this huge move that we're in the middle of... I'm not a big fan of change, and it's driving me insane. When that gets done, I'll be able to play more. I really do enjoy playing the Legends Tour when I can, but I don't think that's going to happen until next year.